In this H2020 project, we are mainly responsible for developing the algorithms falling into the area of understanding the scene together with integrating them into the final solutions that will be developed within the larger project focused on assisted assembly and assisted maintenance of aircrafts. 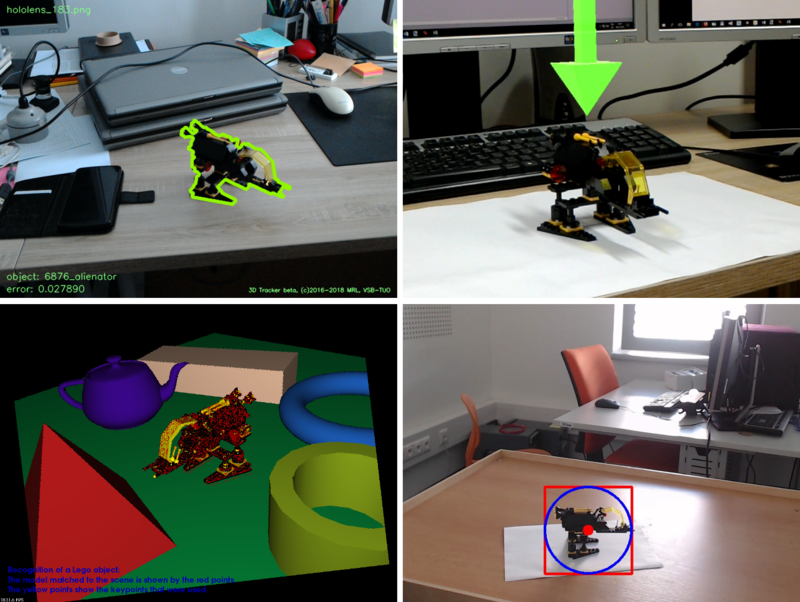 Developed algorithms dealt with recognising 3D objects (using the 3D models of the objects, e.g. the CAD models) and determining their pose for various purposes (e.g. for the general use in augmented reality) from various data sources, including RGB cameras, RGB-D cameras, point clouds, and depth sensors. 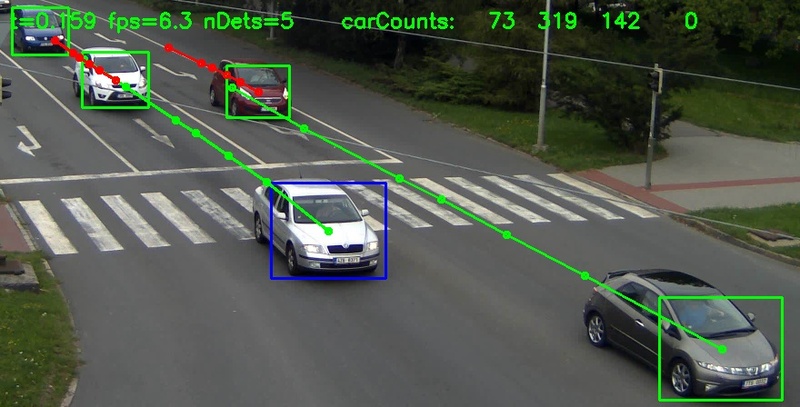 3D object recognition based on artificial intelligence techniques such as deep learning are developed too. Click on the image to see the outputs of our algorithms based on RGB image analysis, depth data analysis, and machine learning. We developed the 3D human skeleton detector that works via fitting a deformable model and runs on data from various depth sensors (MS Kinect, RealSense, etc.). 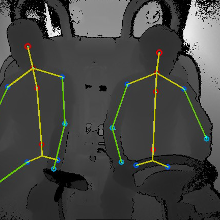 In the model, the positions of the main body parts visible in the camera (head, neck, shoulders, elbows, palms, legs) are recorded and tracked. These data are used for obtaining more complete information about the driver's (or passenger's) behavior. The optical images are used as a supporting tool collaborating with the 3D maps. 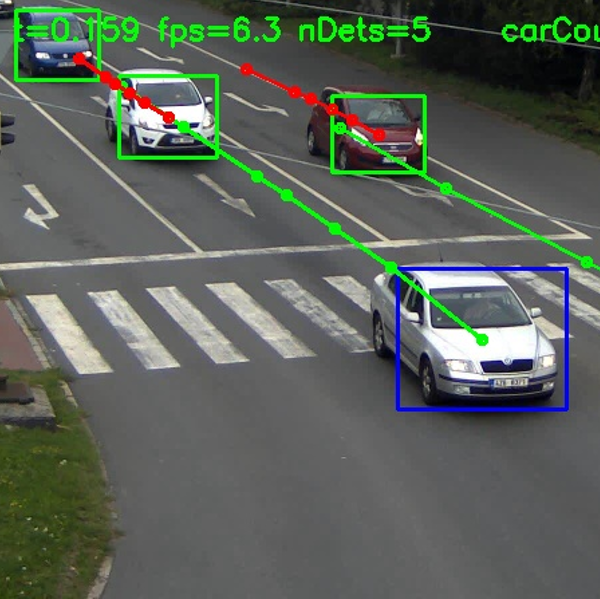 Click on the image to see the algorithm outputs from the laboratory and real driving conditions. 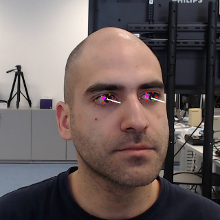 In this project, we created the detector of head, eyes and eye parts (lids, iris, pupil). 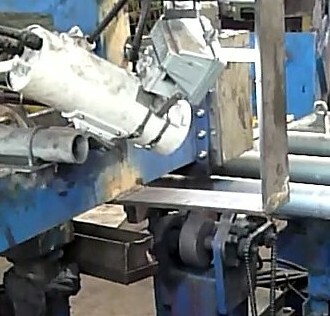 Thereafter these detected parts were used to determine where the driver is looking and to detect the frequency of eye blinking, which is used to recognize driver's fatigue. 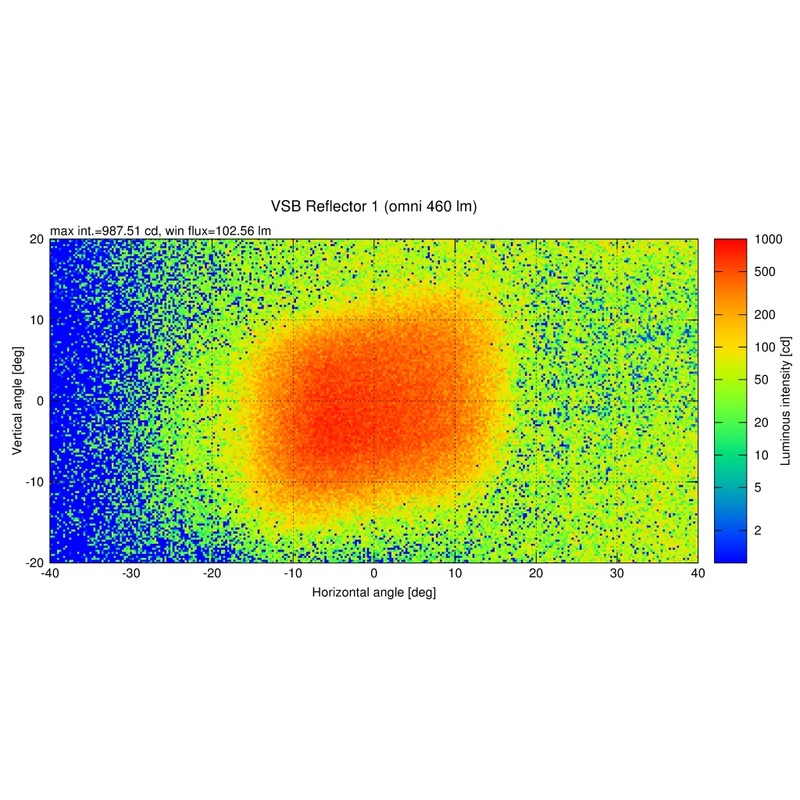 Our developed detector processes images obtained from RGB cameras as well as from near-infrared cameras that allow detection in worse light conditions. 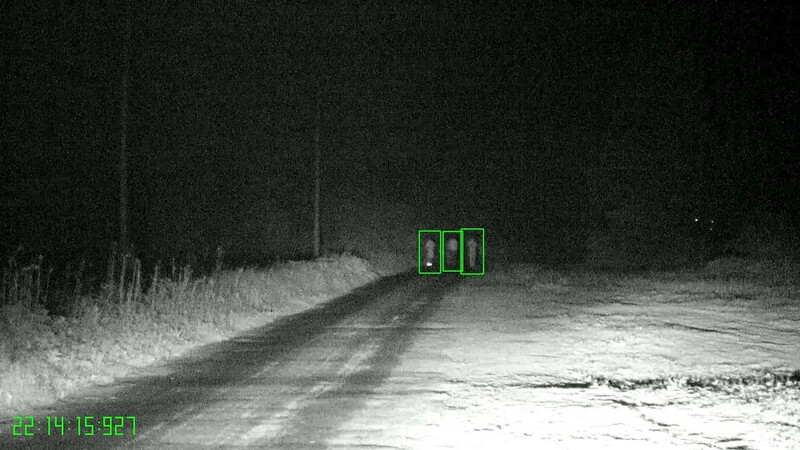 Click on the image to see an example of the detection of eye-blinking (from in-vehicle IR camera) and gaze direction (from RGB camera). 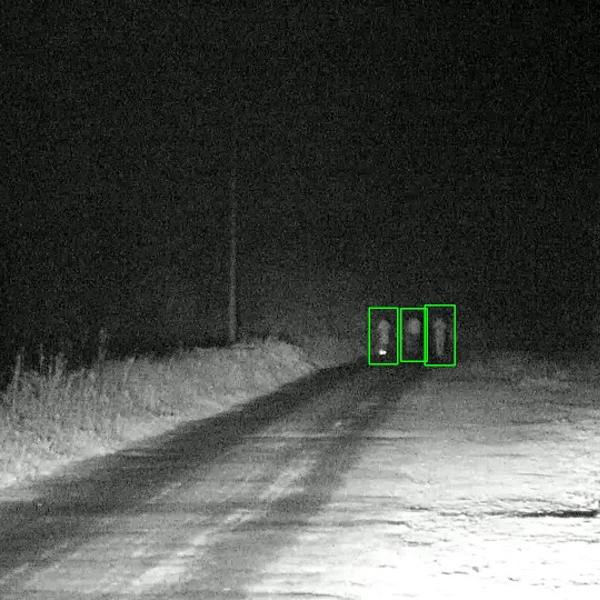 In July 2013, we started the project for detecting the people (animals and other obstacles) in infrared spectra. Detection is carried out in the cars for the purpose of controlling the headlamps. The results of our research will be used by a big headlamp manufacturer. The solution that was carried out in this project (2012) was a part of a bigger project that was done for a recognized car manufacturer (Volkswagen, AG). 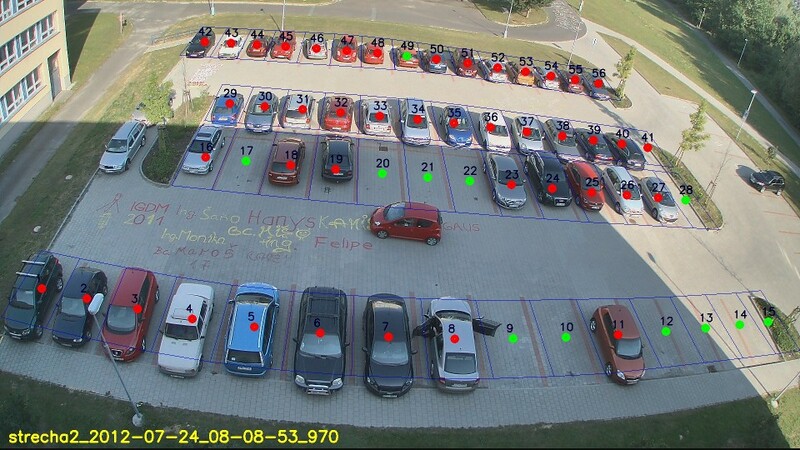 The goal was to detect optically whether the parking place is free or occupied. Several algorithms have been developed and compared (including, e.g., the algorithm based on three-dimensional stereo reconstruction). All the algorithms were thoroughly tested in various weather conditions. The best algorithms were incorporated into the final solution that also includes a database, a small information system and various statistics. The system is now also running in the university campus. 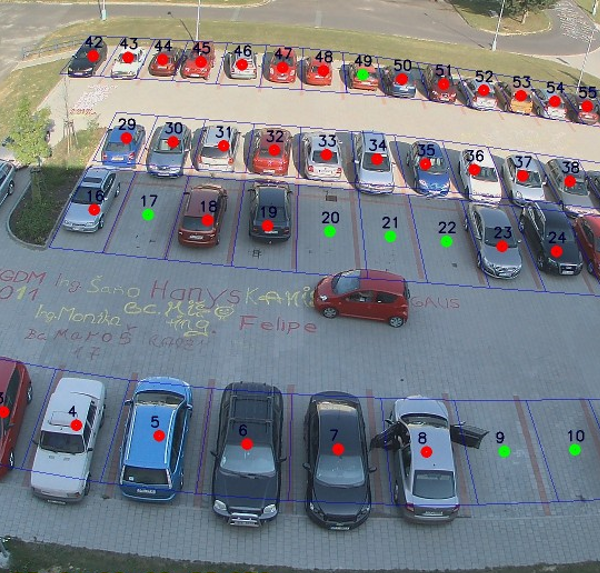 In this project (2009-2013), we create software for computing the light flux from the car lamps (especially headlamps). This project is being solved for a certain big car-parts manufacturer. 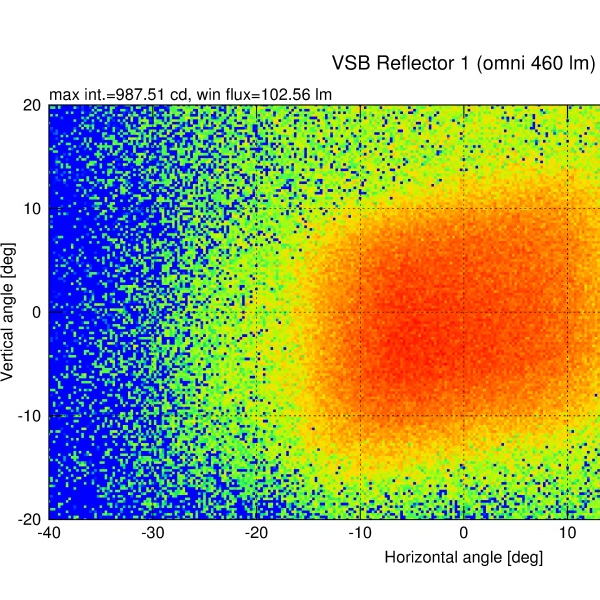 Computing the light flux accurately and effectively is an important task when designing the head lamps. The accurate results are necessary especially in case that new light emitters and new materials are to be used. Since the computation is time expensive on usual personal computers, also the variants using SMP and GPU computing are being developed. In this project, Tomáš is the person doing the majority of work. 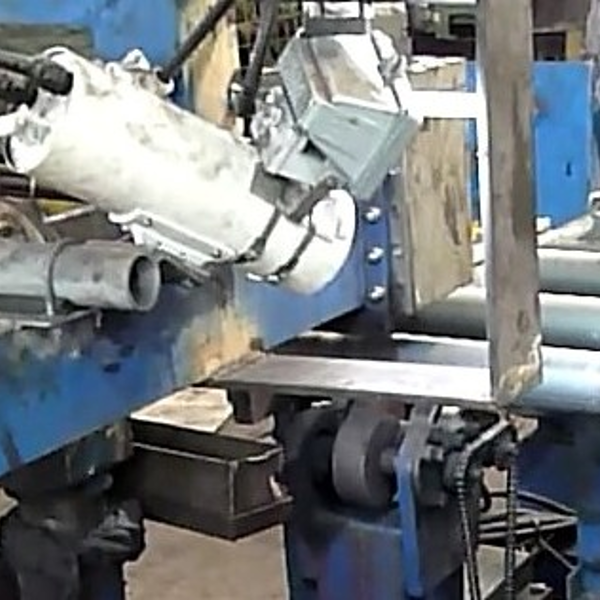 The solution that was carried out in this project (2010-2011) was a part of a bigger device for marking hot steel bars that was realised in Třinecké železárny, a member of the Moravia Steel Group, Czech Republic. As a whole, the solution was designed and realised by the KMC Group company. 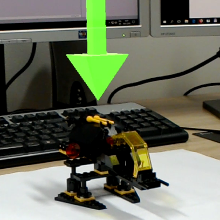 The camera subsystem and the corresponding software based on image analysis have been developed and manufactured by the VŠB-Technical University of Ostrava in our lab. 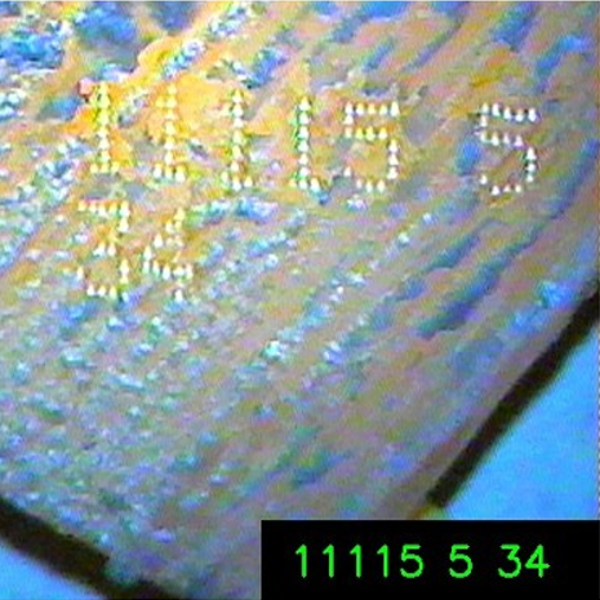 The goal that was followed in this project (2009-2010) was to read, by making use of a camera, the markings that are imprinted on the hot steel ingots. The results of reading are used for production control. 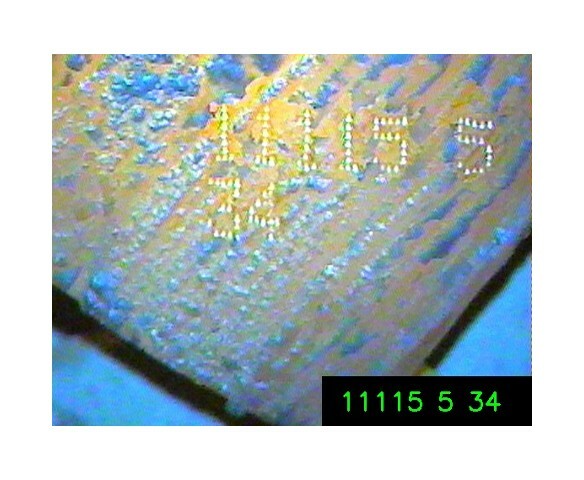 The conditions under which the images are captured and the marking should be read are quite difficult. The project was funded by the Ministry of Industry and Trade of the Czech republic. 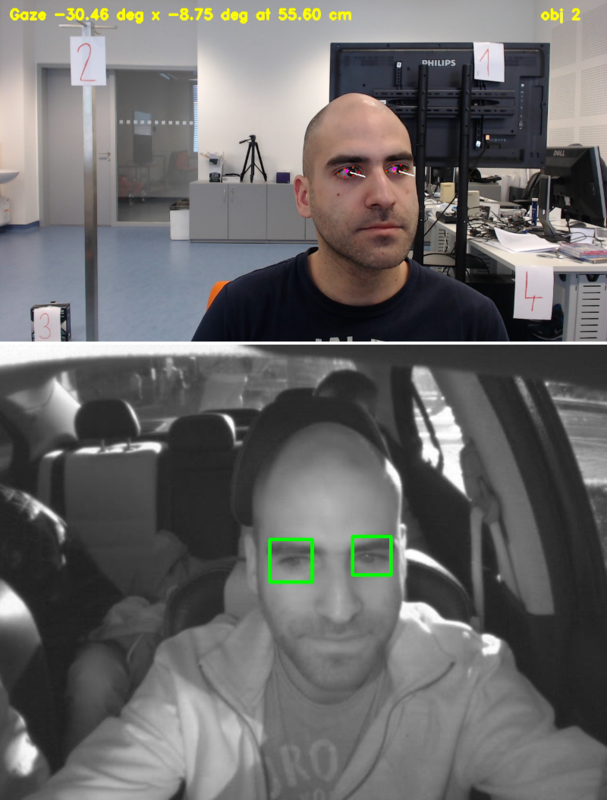 In this project (2009), we created a software for image anonymisation, i.e., for bluring the car license plates and human faces. The project was done for (and funded by) a big European car maker (Volkswagen, AG). For finding the license plates, we have developed our own method. For finding the human faces, we used the AdaBoost method. 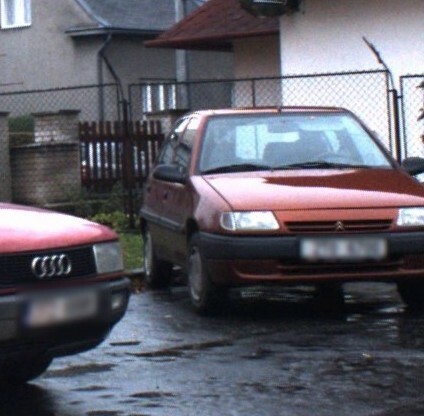 The goal was to anonymise the images captured from the cars (the project that is descibed below). In the big image that is accessible from the left thumbnail, the plates are not blurred in order to better illustrate the problem.